A rich, earthy gravy that everybody can enjoy this holiday season. We love to pour our gravy over errything on that T-day plate, which is why we like to keep it simple. 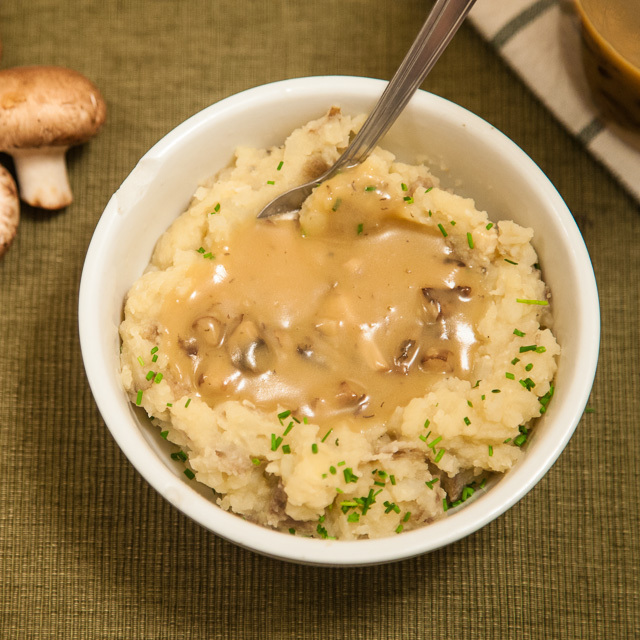 With its rich, earthy flavor, this simple gravy will complement your other Thanksgiving dishes without outshining them. That said, we call this our Basic Mushroom Gravy because you can use it as is OR you can fancy it up with your own additions. We also know that making a roux for the first time can be intimidating, so we encourage you to watch our video to get a better idea about what to expect before you start. If you want to learn more about the nutritional value and health benefits of mushrooms check out this great post by our friends over at Thrive Cuisine! A rich, earthy gravy that everybody can enjoy this holiday season. Note: Making a roux for the first time can be intimidating, so we encourage you to watch our video to get a better idea about what to expect before you start if you've never done it before. Dice mushrooms and stems. Heat one tbsp of olive oil in a pan and add mushrooms and a pinch of salt (this helps draw out the liquids). Saute until most of the liquid gets cooked out, about 10 minutes. If the mushrooms start sticking to the pan too much during this step, you can add more oil and/or turn down the heat a bit. Turn the heat down to low and add the 3 tbsp olive oil and the 3 tbsp flour. Whisk rapidly for two-three minutes, until a roux is formed, which should have a nutty aroma and look like a thick yellowish paste. Turn the heat back up to medium. Add ½ cup of broth at a time, whisking each one in until it’s fully incorporated. Add broth until you’ve reached your desired a consistency that is smooth and a little bit runny. After you’ve whisked in all of the broth, let the gravy stand until it starts to bubble and thicken, then add a pinch of salt. Remove from heat. Make the gravy in the pan a little thinner than you want your final product to be - the gravy will continue to thicken as it cools... Conversely, if you go overboard with adding broth in the pan and think that you’ve made the gravy too thin, simply keep cooking on low until the gravy thickens back up again.